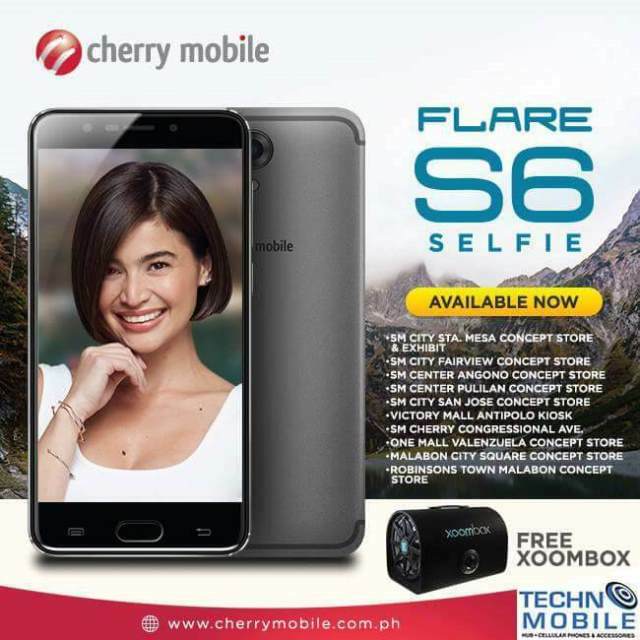 Get a free Xoombox from Cherry Mobile for every purchase of the Cherry Mobile Flare S6 Selfie, available now! The Cherry Mobile Flare S6 Selfie, a 5.2-inch smartphone, delivers a 16-megapixel rear and front camera setup that can take beautiful pictures even in low-light situations. Not only that, but it runs on a reliable 1.5GHz octa-core processor and 3GB RAM. Meanwhile, to ensure that you rarely ever delete your treasured photos, the Flare S6 Selfie comes with 16GB storage. Still not enough? Cherry Mobile also gives users the ability to expand this to 128GB via microSD. Moreso, every new purchase of the Cherry Mobile Flare S6 Selfie at select Cherry Mobile concept stores and kiosks comes with a free Xoombox! The Xoombox acts as a reliable bluetooth speaker that will blast any streamed audio or video with full clarity. Get a full multimedia package now with a Flare S6 Selfie purchase!